Liam points his black eye. He tells Steffy that Bill should have regrets. 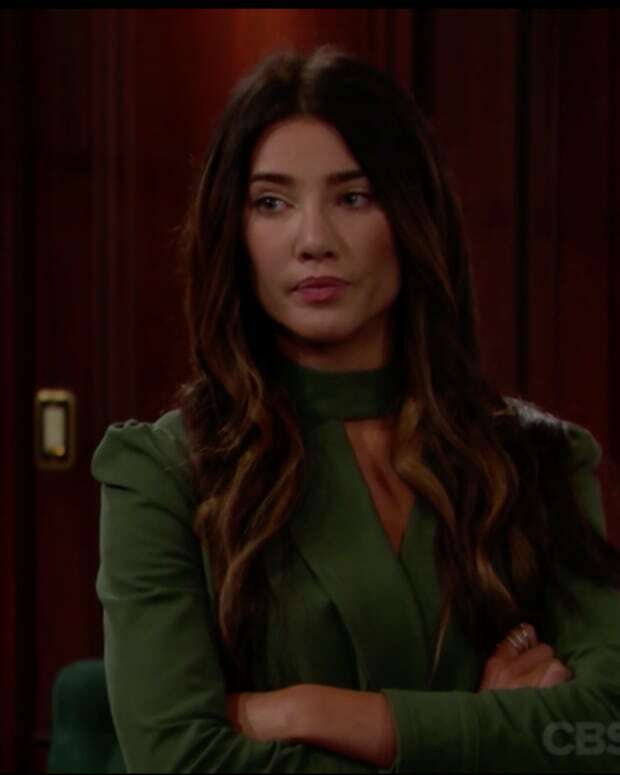 Steffy wants the nice guy she married, not this version. She keeps pushing for a reconciliation, but he&apos;s not biting. Later, he vows that Bill is not coming back to Spencer. Sheila&apos;s comfortable wearing Eric&apos;s robe whilst looking at the picture of Quidge in the elevator. At the office, Quinn brings up Brooke to Ridge. Quinn thinks Bill will eventually push Brooke away and not to give up. They hug it out before he leaves. Charlie gets a call from Sheila. She&apos;s happy that Charlie is her partner who is keeping an eye out for any illicit behavior from her targets. Charlie goes to see Quinn. He tells Quinn that Sheila is still in town. She runs out the door and tells Charlie to text her Sheila&apos;s address. Bill begs Brooke to stay. She goes back into her room, trying to absorb the shock. Brooke wonders what she&apos;s done. She tells him she didn&apos;t want this kind of life with him. She can&apos;t continue to live this way. She loves the fantasy of Bill, but now she has to think about everything. She asks if he could hit Liam, would there ever be a chance he could hit her too? Quinn starts pounding on Sheila&apos;s door. Sheila needs a minute to ditch the robe and the portrait she&apos;s been talking to. Quinn wants to know why she&apos;s still in Los Angeles. She accuses her of plotting against her. When Quinn picks up the phone, Sheila smashes it. The two start fighting...again. A maid interrupts. When she sees them on the bed, she puts the "do not disturb" sign on the door and closes it. Brooke tells Bill she has a right to be angry. She warns him there will be consequences. She tells Bill she needs time to think about their marriage and who they are. She demands to know when enough is enough. She walks out. Sheila wrestles into a position that could harm Quinn. She tells her she will get rid of her, but not by killing her. Quinn tells her she will never have Eric, even after she tried her best to break them up. After she leaves, Sheila laughs at Quinn&apos;s ridiculous comments. Brooke runs into the CEO office, thinking about her fight with Bill. She breaks down and sobs. Guess who comes in? Ridge. He wants to comfort her. She turns to him and they embrace.